This book is an elaboration of the systematic radical scholarship of the early 1970s and 1980s on Africa’s dilemma in the world’s capitalist system. This book affirms that the exploitation of Africa from the period of its sordid and unpleasant contact with the West has continued into the recent neoliberal era. Neoliberalism is understood by our author as the dismantling of barriers to corporate globalization and accumulation evident in the imposition of free trade agreements, austerity, and attacks on unions (3). The book situates the theoretical import of Africa’s current dilemma within the context of Africa’s historical contact with the colonial powers and the abiding consequences of the improperly executed political independence of the colonized territories of Africa. This book has two broad parts. The first part highlights the legacies of colonialism including the poor or limited capacity of the emergent ruling classes in Africa and the uncritical acceptance of neoliberalism with all its socioeconomic and political implications for Africa’s development. The author observes that the often-publicized claim of ‘Africa rising’ ‘does not take into consideration the contradictions in the nature of Africa’s economy’ (120). In part two of the book, the processes that led to the new scramble for Africa, and in particular, the heightening interest of the West and China in Africa’s oil and natural resources, coupled with the attendant crises of this new phenomenon, are chronicled. The author analyzes the features and consequences of the scramble for Africa’s resources, and observes the weak regulatory environment of foreign investment in Africa, which in itself depicts the weakness and inability of the governing elites in Africa. Chapter six of the book, Resource curse or Resource wars, presents an explicit survey of the situations across the continent and identifies lack of transparency, proneness of the processes of the investment in the oil and mineral sectors in Nigeria, Angola, Democratic Republic of Congo (DRC) to corruption, and the absence of result-oriented reforms in the regulatory framework for corporate extraction as some of the factors responsible for the lackluster performance of extractive industries in Africa. The chapter concludes that ‘African societies are not cursed by natural resources, but by imperialism, neoliberalism, and wars occasioned by the drive for extraction and profits’ (190). The seventh chapter exposes the desperation of the US to retain its sphere of influence in Africa, through its militarization project tagged African Command (AFRICOM), which the US portrayed as being in the best interests of Africa, but which our author forthrightly describes as a grand strategy of the US’ ruling class to protect America’s interest in Africa – an interest that the growing relationship between Africa and China could threaten (195). The new contest for Africa is assessed as ‘cold war imperialism in Africa ’(196) whilst humanitarian intervention in African situations by the West, especially the US, is portrayed as constituting ‘the geopolitics of imperial energy security’ which the US has been utilizing to sharpen its Foreign Policy, particularly since the collapse of the Soviet Union (195). The eighth chapter, Class Struggle and Permanent Revolution, highlights the series of protest and resistance movements organized by the working class against the policies of the ruling classes in Africa. These included strikes against wage cuts, anti-poverty activism, mobilizations for AIDS treatment, and struggles against the privatization of water and electricity, and movement for debt relief. The author asserts that many of those struggles laid the basis for alliances and longer-term battles over basic needs and human rights for workers and the poor today (234). The extensive theoretical debate on the analytical utility of Trotsky’s concept of ‘permanent revolution’ did not add any substantial value to the popular understanding of revolution (238- 241). There is a glorification of workers strikes in Africa in periods between the 1990s and 2015, especially in Nigeria, Burkina Faso, and South Africa, which the author in her celebratory tone describes as ‘the revolutionary wave’(243). There is the need for in-depth analysis of the workers union and their strategic operations in Africa in order to bring clarity to the modes of operation of this critical group in the socio-economic formations of African societies. African working classes in today are bereft of the ideological objectives which ought to drive their agitations and originate ideologically-propelled revolution of the type that the Marxists anticipate. The narrative of the book gives the impression of Africa’s helplessness to reverse its unfortunate relations in the global capitalist order. The responsibility for Africa’s extant economic and political underdevelopment is placed at the doorstep of the misfortune of its contact with the West. The question to ask is: how can the colonial past still hold Africa hostage despite its political independence? Our author admits that western multinationals and African elites have accumulated vast profits from their investments in Africa’s abundant natural resources, and notes that such collusion is not a new reality (4). In critiquing the myths and realities of Africa’s underdevelopment, an attempt was made to present a new perspective on Africa’s reality. However, certain issues were avoided. On the myth that Africa’s poverty is an inevitable, inescapable feature of African States themselves; our author did not explain why postcolonial African states could not restructure the inherited structures of underdevelopment (8). On the claim that: Any debt owed by the West has been paid in full and must be put behind us, our author asserts that ‘African poverty is rooted in the global relations of postcolonial states burdened by the legacy of colonialism and neoliberal policy- policies embraced today by the world’s ruling classes, including African ones. But, our author unwittingly plunges herself into a blame game in an attempt to redress what she calls ‘blame the victim foreign policy’ (8). The related question on whether Africa needs reparation was not answered by our author. In her critique of the fallacious and contentious assertions of some western scholars (including Paul Collier, Jeffrey Sachs and Joseph Stieglitz) that the possession of abundant natural resources by developing countries have continued to turn out to be a ‘resource curse, our author opines that such views are ‘ahistorical explanations which overlook the structural and the distorting impact of the extractive industries and capitalist global relations (9). But, the issue is not the ahistorical nature of the assertions of those western scholars; rather, it is their deliberate design to divert attention from the problem of leadership in Africa. The dearth of visionary leadership in Africa ought to be scapegoated as the main reason why the natural resources which are better harnessed and utilized for the development of some other countries are mismanaged in Africa. The myth that African nations are ungovernable dominated by failed states and trapped by an unrelenting propensity for conflict and violence was blamed on international media for biased reportage on Africa. The author notes that the misrepresentation of Africa was without regard to context which gives the erroneous impression that the continent ‘is given to fighting over no discernible issue’ (9). The point ought to have been made that African nations are not ungovernable, they simply have not been governed well since their attainment of political independence. On the myth that ordinary Africans are merely passive victims of authoritarian African rulers or fueled by the conflicts of age- old ethnic divides, our author observes that ‘such myths of African rulers and citizens as rooted in primordial violence create a dangerous justification in an imperial context’(9) . She therefore opines that: ‘ostensibly only international (Western) intervention – of the watchdog, humanitarian or direct military kind- can save the continent from inevitable bloodshed’ (9). Our author’s sarcasm on this very serious matter is untenable. It is not right to present ethnic conflict in Africa as ‘primordial violence’. Ethnic rivalries and conflict are a manifestation of poor governance in African states. On the last myth that mass unemployment and crisis make resistance in Africa futile our author observes that those sordid existential realities have rendered political organization and sustained resistance impossible (9-10). She expresses great optimism about the prospects of mass struggle from below in countries such as Burkina Faso, Nigeria, South Africa, Ivory Coast, and Zimbabwe, and affirms that the working classes in Africa hold the potential to lead in the struggles for change on the continent, from the urban slums to the rural poor’ (255). But these expectations are not hinged on the objective conditions of working classes in Africa. 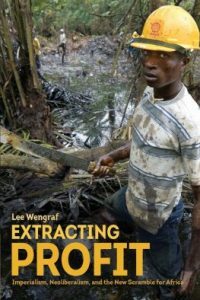 Lee Wengraf’s book is an interesting piece on the exploitative mechanics of global capitalism in contemporary times, using the ever-increasing propensity for capital accumulation from the oil fields and rich mineral deposits in Africa by the countries of the West, especially the US as the indicator of the new age means of perpetuating Africa’s underdevelopment. The growing relevance of Africa to the geostrategic calculations of the US and China is brilliantly analyzed with empirically verifiable data. In addition to the identification of the deleterious consequences of Africa’s disadvantaged status in the global capitalist system, strategies for Africa’s transformation through organized working class struggles and resistance are advanced. Evidently, this book is well-researched and it contributes to the expansion of the frontiers of Marxist scholarship on Africa’s development dilemma within the global capitalist order. This book lends credence to the pioneering works of such notable radical scholars as Andre Gunder Frank, Walter Rodney, and Samir Amin among several others. It should be read by students and teachers of political economy, development studies, Marxism and philosophy.